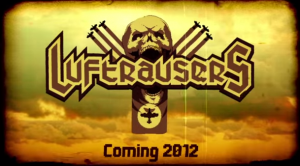 The first time I saw the preview trailer for LUFTRAUSERS, I thought of Nazis. Gothic font, banner with white spot and black symbol. Skull. Sepia motion picture animation. Video game makers adopt a specific set of visual references and use them as a way to help players “understand” the conflict at the center of the game. Video games sometimes offer just enough historic and cultural references to legitimize the game in the minds of players, and in some cases make the game seem literally “historical.” When game designers get too literal in their visuals in reference to tricky historical situations, they may open themselves up for criticism. In some cases, like the game Boom Beach, designers obscure historical settings and circumstances, but avoid criticism. LUFTRAUSERS’ creators chose to use sensory assets that reference German forces in World War II. I’m in fact a little shocked by the overt visual references to the Luftwaffe. The game is a sepia-toned 2D aircraft sim in which players fight for survival against waves of enemy aircraft and ships. Simple controls and a fire rate that brings to mind games like Galaxian make LUFTRAUSERS an intense, though very arcade-like game. I later learned I was not alone, and was preempted by Patrick Klepek, and his very useful compilation of reactions to LUFTRAUSERS’ visuals. I was also unaware of the response to criticism given by LUFTRAUSER’s developers, Vlambeer. The fact is that no interpretation of a game is ‘wrong’. When you create something, you leave certain implications of what you’re making. We can leave our idea of what it is in there, and for us, the game is about superweapons. We think everybody who plays LUFTRAUSERS can feel that. Feel what you will, I tend to connect the genesis of historical concerns about “superweapons” to World War II. Vlambeer expands on LUFTRAUSERS’ setting..
From our perspective, we do not cast our player as a Nazi pilot. LUFTRAUSERS is a dogfighting game very much inspired by a very specific century in the history of mankind. Somewhere between the 1900’s and the 1980’s, there was a period in which military intelligence was capable of determining whether an opposing military force was working on secret weapons, but not quite what those weapons were. The first time this really was a problem in our modern history was during the First World War, and it continued well throughout the Second World War and the Cold War. Only in the last decades, humanity has become capable of fighting such ‘fantastic fears’ with an even better capacity to spy upon our fellow humans. I’m not satisfied. The first time I saw a preview video for LUFTRAUSERS, I was immediately reminded of the black and white footage used in the BBC series World at War– specifically footage of Luftwaffe Stukas attacking British ships in the English Channel. That’s just a gut response, to be sure, but there is little chance that a player would not think that the protagonists of the game were Germanic. The fonts used are gothic. Soviet Cold War era protagonists would be depicted through the use of cyrillic or pseudo-cyrillic fonts (that’s the video game trope anyway). The in-game technological level- single wing aircraft, aircraft carriers, aircraft attacks on shipping- is post World War I. The lack of German military action in the Cold War places the game’s visual references in the World War II period. i don’t believe vlambeer are nazi sympathizers or anything vile like that. seems more to me like *fascination*. which is its own problem. This also brings to mind the question in relation to the criticism of video games- “How much fantasy is really in a “fantasy” or “alternate history” or in the words of Vlambeer a “game very much inspired by a very specific century in the history of mankind?” How much criticism of a game can be successfully countered by calling the game a fantasy? Can we respond to the misogynism in Grand Theft Auto V by simply pointing out that Los Santos is not a real place? What about an approach to visually depicting historical circumstances in video games without being so literal? I recently, after hearing students talk about it, took some time to try out a very popular new iOS game Boom Beach, which also implies a World War II setting. What strikes me most about the game are the ways in which the designers wanted to invoke memories of World War II without the tricky stuff. There seems to be a careful manipulation of visual assets that imply World War II, but also a rearrangement of the details to avoid criticism of any historic foundation of the game. The game’s basic titular concept is amphibious invasion. 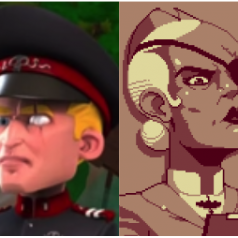 Like LUFTRAUSERS, Boom Beach’s visuals strongly imply a World War II setting. The player seems to be American, and the enemy German (“Lieutenant Hammerman of the Blackguard”) in the same way that the player’s comrades in LUFTRAUSERS are German (down to the Prussian dueling scars). The islands in the game reference Pacific islands, which historically would not be the setting for an American fight against Germans. Why, then, is the enemy not Japanese? What sort of visual depiction would that type of character require in a World War II setting? Are Nazis safer enemies in a cartoon-ified free-to-play iOS game? What if the setting were changed to an authentic American vs. German amphibious location like the beaches of France or Italy? Is it a little too soon after Saving Private Ryan for a wide Apple Store audience to handle a casual game that seems like Omaha Beach? In Boom Beach, there are native peoples inhabiting the islands. How can one depict natives without fear of criticism? Done. In some cases, visual assets in “historical” games are almost like film negatives- the forms and shapes are there, but the colors are inverted. Enough of my rambling. Here’s some homework- what do you think about Clockwork Empires? Literal or obscured? 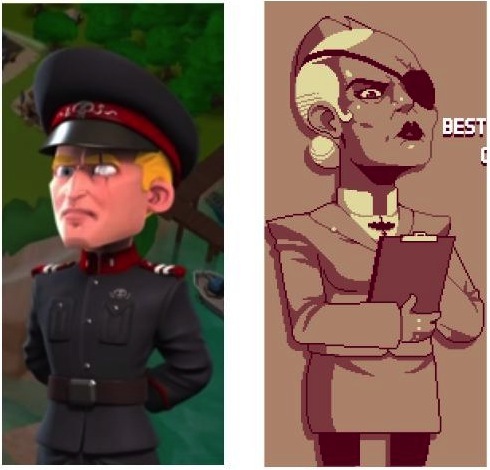 I think you hit upon a good point with Boom Beach in that while it’s absolutely supposed to have a World War II setting, the designers (Supercell) went to great lengths to fictionalize it so that it didn’t evoke historical comparisons. I hadn’t thought about how it uses a Pacific Theatre setting (islands) but with a European/German antagonist. Supercell is a Finnish company–I wonder how much that played into the design decisions.